Beautiful 2008 Rizzini Round Body Classic with oil finished exhibition grade walnut stock, fitted with Silver's recoil pad in Best London Orange. In its original box with unused spare chokes. I can only describe it as being in as new condition. It represents a very good saving over the current new price. DBHE OU 20b Rizzini Round Body EL over & under for sale. DBHE OU 12b Rizzini Round Body EL over & under shotgun for sale. DBHE OU 16bore Rizzini Round Body EM over & under shotgun for sale. DBHE OU 12b Rizzini Aurum Light over & under shotgun for sale. 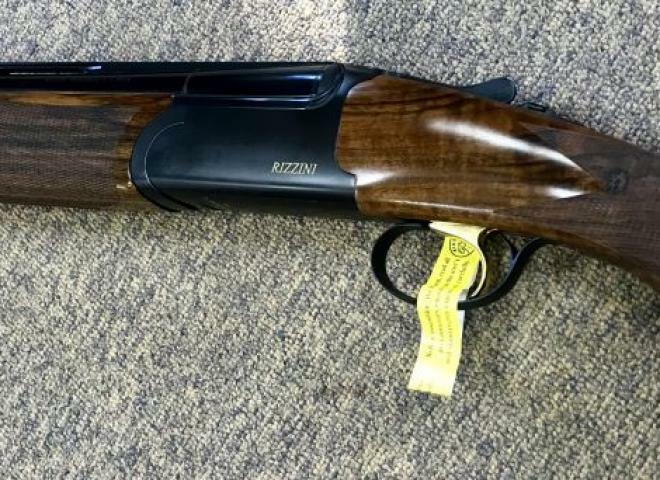 A beautiful pair of Rizzini SE1 12 bore shotguns, purchased 18 months ago only had 1 full game season, so still like new! Multi choked by Teague, detachable trigger units. makers leather double gun case. LITTLE USED ROUND BODY EL, GAMESCENE SURROUNDED BY GOLD INLAY AND SCROLL ENGRAVING. A Beautiful round body action with deep floral scroll engraved sideplates, highly figured stock with rounded pistol grip and matching push rod forend, 3" magnum and super steel proofed, automatic safety catch, compact ABS travel case. A beautiful round bodied deep scroll engraved game gun. Ideal for early partridges or later high pheasants. This gun has been shot once late last season and a very good buy as it is in immaculate condition. First to handle should buy !! 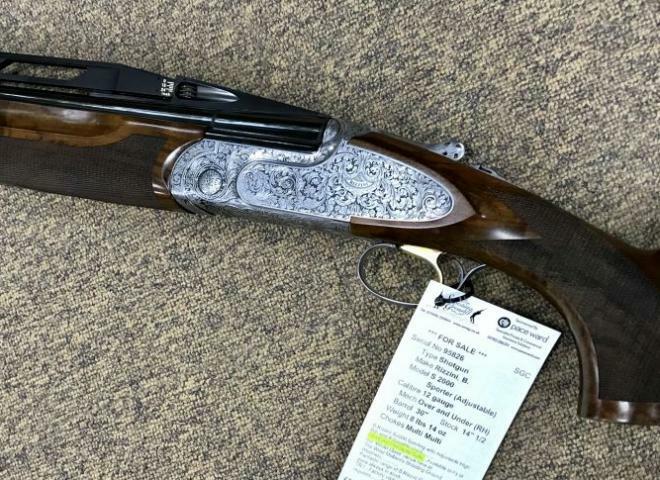 A pristine example of this super handling game gun, deep floral scroll engraved action, well figured stock with rounded pistol grip, 6mm game rib, manual safety catch. BEAUTIFUL FACTORY MATCHED PAIR OF REGAL SIDEPLATES WITH DEEP SCROLL ENGRAVING. 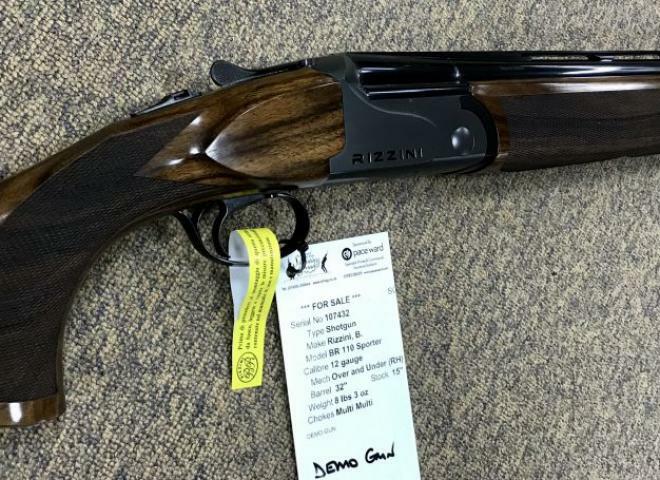 NEW however fired 50 cartridges, Rizzini BR110 Game gun offered at great value as this gun is an unwanted gift! ROUND ACTION SIDEPLATES WITH DEEP SCROLL ENGRAVING. A STUNNING ROUND BODY EL DELUXE, GAMESCENE ENGRAVING WITH GOLD INLAY SURROUNDED BY PHONE SCROLL, FINISHED OFF WITH LONG TRIGGER TANG AND CAPPED PISTOL GRIP. A TRULY STUNNING PAIR OF RIZZINI ROUND BODY EM DELUXE, HARD TO FIND A BETTER LOOKING PAIR FOR THE MONEY! ROUND ACTION WITH DEEP SCROLL ENGRAVING. COMPLETE WITH 2 ABS CASES. THE ROUND BODY RIBLESS RIZZINI EXCLUSIVE TO IAN COLEYS, SPECIALLY DESIGNED BY US. LOVELY QUICK HANDLING PAIR OF GAME GUNS. COMPLETE WITH DOUBLE ABS CASE. 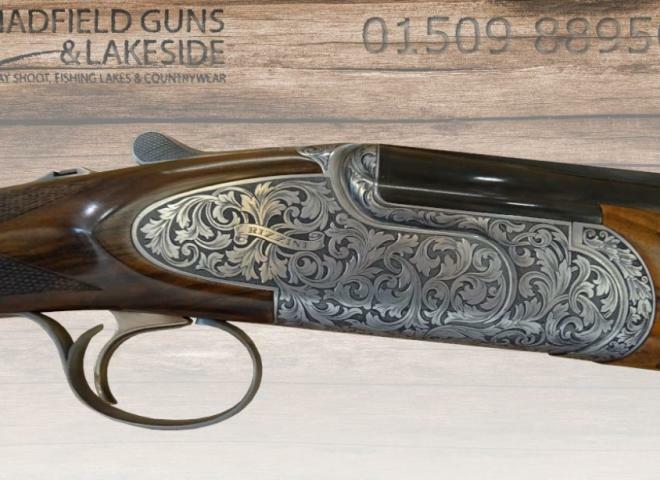 BEAUTIFUL RIZZINI ROUND BODY EM DELUXE, DEEP SCROLL ENGRAVING WITH LONG TRIGGER TANG AND CAPPED PISTOL GRIP. 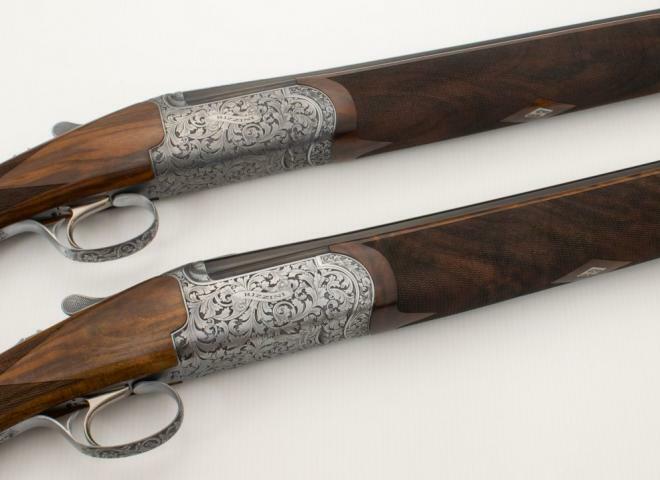 A TRULY STUNNING PAIR OF RIZZINI ROUND BODY REGAL DELUXE, HARD TO FIND A BETTER LOOKING PAIR FOR THE MONEY! 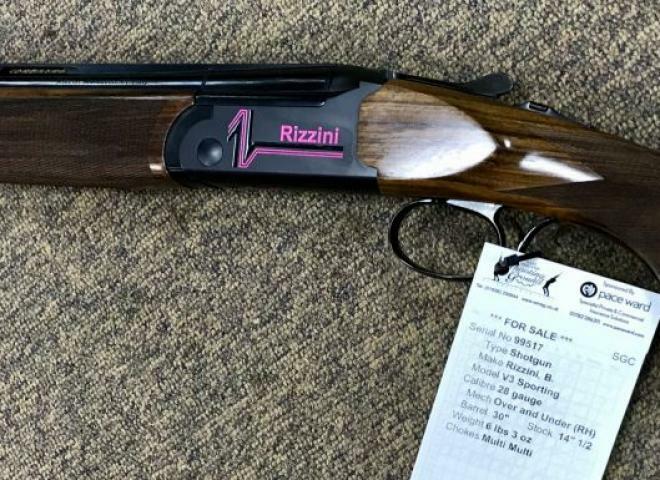 A TRULY STUNNING RIZZINI ROUND BODY REGAL DELUXE, HARD TO FIND A BETTER LOOKING GUN FOR THE MONEY! COMPLETE WITH COMPACT ABS CASE. LOVELY QUICK HANDLING GAME GUN. LOVELY MATCHED PAIR OF RIZZINI ROUND BODY REGALS. DEEP SCROLL ENGRAVED SIDEPLATES, AND MATCHING WOODWORK. This is No 1 of 2 that is paired with stock No. 181012/004. 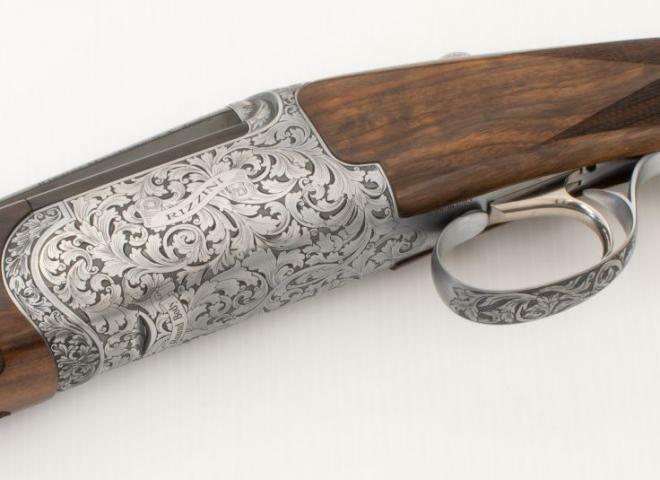 THE BEAUTIFUL ROUND ACTION RIZZINI, DEEP SCROLL ENGRAVING. PERFECT 20 GAUGE GAME GUN. AS NEW! BOUGHT 5 MONTHS AGO AND HAS DONE HARDLY ANY WORK. COMES WITH ORIGINAL BOX 6 x CHOKES AND KEY. 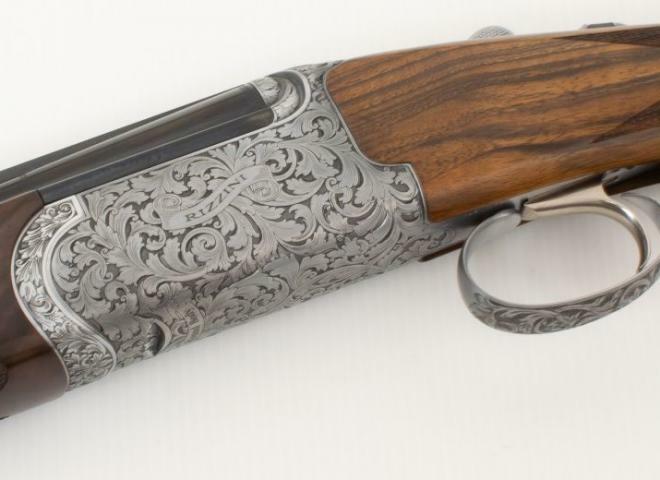 Ex demo model in as new condition, beautifully engraved round body with deep acanthus scroll work, high grade walnut stock with rounded pistol grip, 6mm game rib and automatic safety catch. 3" mag and super steel proofed. 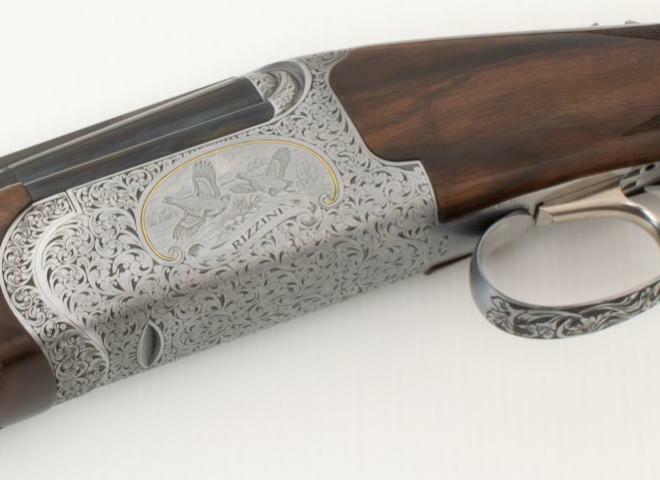 Stunning B.Rizzini RB EM Deluxe game gun with a deep round bodied coin finished floral engraved action. 12 months old, in very good condition. boxed with chokes and key. A brilliant and beautiful side by side, featuring hand engraving on a chrome line finished action. 30" barrels and multi chokes make for a brilliant gun that's equally at home on game or even on clays.